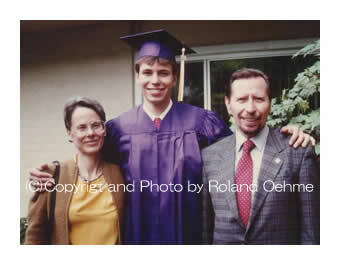 My dad, Wolfgang Oehme would have turned 82 on May 18th, 2012, so this is a good time to reflect on his life. Life is a bit quieter and mundane without my larger than life dad. He was an extraordinary person who had a great enthusiasm for creating gardens and getting people excited about plants and gardens. I am reminded of my father every day I drive through Towson since I see his gardens and renegade guerilla gardens he designed and planted. He was doing guerilla gardening before the term was coined. One can see his guerrilla garden that is in the park that stretches along Towsontown Blvd. on both sides of York Rd. He planted many trees in this park that are looking great. He also designed the median and Marge Crook Memorial Garden along this boulevard that is in dire need of weeding. garden will be well maintained in the future and kept as it is. On May 3rd there was the Towson Gardens Day celebration that included a tour of the TC Gardens led by landscape architect Avery Harden. Avery is the codesigner of the TCG. This is the first year he gave a tour without my dad. Let us continue to bring beauty and life to this world like Wolfgang did to make this world more beautiful and diverse for us all. 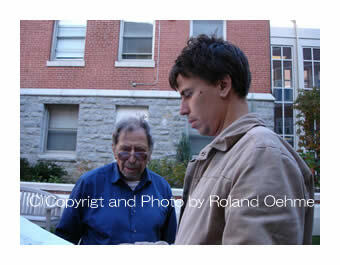 My dad, Wolfgang Oehme, died last Thu., 15 Dec. 2011 at the age of 81. As can be seen by all of the messages that are being sent to us expressing appreciation for my dad, he was loved by many. Thank you all for your kind words for my father. 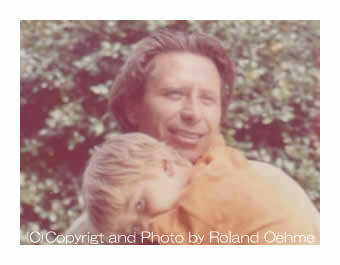 However, for me, as his only child, I loved him deeply and he meant much more to me than words can express. My dad was my best friend, my mentor, my partner, a loving father, my favorite landscape architect, he even felt like he was a part of me. I feel very sad to see my dad leave this world. His passing really hit me hard since I expected him to live another 10 – 20 years. He was larger than life in many ways and seemed immortal, and proudly exclaimed that “I will live forever!” Alas, he was killed by cancer before his time was due. Perhaps, it was my dad’s stoic nature that downplayed his condition that is to blame, for we did not know about the seriousness of his cancer. He will be greatly missed by me and our family. I wished he had lived longer so he could be a big part of his grandchild’s life, since I hardly knew my grandparents. 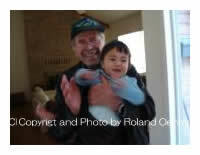 My dad did get to play some with our son Yuma, who is 2 years old, and we treasure those moments. My childhood does not appear to have been your normal suburban upbringing by most accounts. My dad was not working in a typical office job, teaching me to play baseball or soccer on the weekends. No, this never happened. I did love sports and I had to do it with my friends on our own with no real guidance. 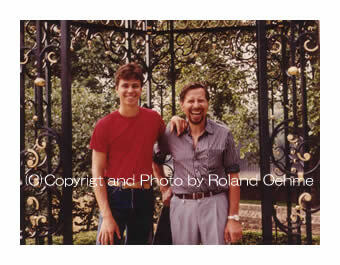 On the contrary, my time with my dad was spent in his world of plants, gardens, parks, animals, and wilderness. I have many fond memories of my childhood where I discovered so many interesting things and had many beautiful experiences with my father. My mom did manage to bring some culture into my experience visiting museums and hearing musical performances. And, my friends and I were allowed to go exploring our local neighborhoods, stores, bowling alley, school yards, commercial buildings, forests, and streams. 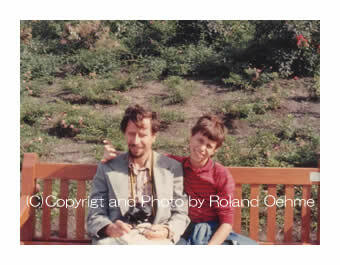 In fact, I treasure all of the time I spent with him and the time I spent in his gardens, for they were magical places. 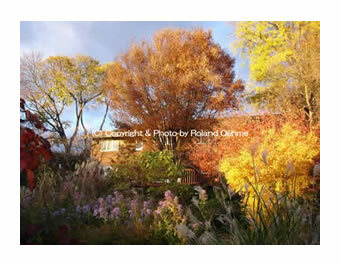 I have never visited any garden as special as his, and I felt life was not full unless I could live in his garden. I spent years away from home and could not wait to visit him and his garden again. There was something so natural, so calming, so effortless, so beautiful, so full of life, so entertaining about his gardens. To me, his gardens were the quintessential “Garden of Eden”. Living in his garden was so soothing and fulfilling that I really did not want to go anywhere else, for everything was here in his garden. There was a fish pond, frogs, dragonflies, snails, raccoons, rabbits, chipmunks, foxes, insects, bees, pollinators, beetles, butterflies, hummingbirds, all kinds of songbirds, hawks, blue herons, owls, many colors of flowers throughout the growing season, gently waving grasses in various textures, a swimming pool, a vegetable garden, a patio, a deck, fruit trees, flowering trees all within his garden which was located close to the urban area of Towson. One time I climbed up on his house roof and took a picture with a wide angle lens capturing his garden and the neighbors’ gardens on either side of his garden. The contrast was stunning! My dad’s garden was teeming with life and beauty and both of the neighbors’ gardens, as all typical lawn focused suburban gardens, were boring, devoid of life, and nothing to see except lawn and a few trees. It was then I realized how special my dad’s garden really is. 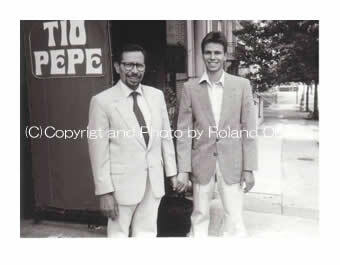 My dad was a huge part of my life when growing up and I really looked up to him for guidance. He took me almost everywhere that he went. That meant driving to his office and to his firm’s job sites to manage the landscape works in progress. This was usually interesting since each construction site was different and there was always something new happening. Other times it could be rather boring sitting through meetings or just waiting for him. However, I was just happy to be with my dad. And, I was learning many things about how gardens were built and witnessed the amazing way my dad formed friendships with many of his clients. We also visited many plant nurseries where my dad felt right at home selecting the finest tree specimens, or loading up our small Volkswagen to the roof with perennials and grasses. As I got older, I got to work with him on his projects usually on site doing maintenance, installing a garden, meeting with clients, and whatever was necessary to get the garden built. 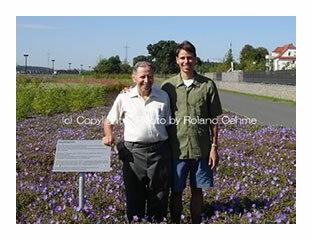 I remember helping my dad weed the Campus Hills Community Garden on the median along Goucher Blvd. every Sunday morning until around noon. I would get really hungry but he would not let us stop until we were finished that section we were working on. Much of the work was in the Washington, DC area, and other projects were in other parts of the country where we would travel to. We installed or maintained his solo projects or OVS’s gardens together in Champaign, Illinois, Southampton and Manhasset, New York, Virginia, Maryland’s eastern shore, Augusta, Georgia, and Germany. We traveled to Germany almost every summer as a child until I left home after high school to apprentice as a landscape gardener in Germany for two years. Germany was like a second home for me, and we had many friends and relatives to visit and stay with. We had many good times and visited many towns, gardens, and parks during our stays there. I think I learned more in Germany about plants and landscape design during our few weeks stay there, visiting botanic gardens and garden shows, than I did during a whole year at home. The learning was intense. Almost every day we were visiting a different garden, snapping thousands of slides each during the course of our trip. 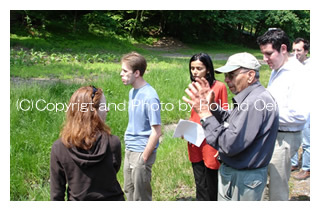 I was learning the plant names, how the plants grew, and in what context the plants were best used to greatest effect. One of our most favorite gardens was the Berlin Botanic Garden where we would spend one or two days strolling through every part of the immense park and the lush conservatory. The BUGA or Bundesgartenschau, translated as the Federal Garden Show, was the horticultural and landscape highlight of our trip to Germany. Like the Olympics, the BUGA was held in a new German city every two years and involved a competition for the master plan and many other designers and builders of all sorts. Usually hundreds of acres in size, the site was often a former industrial site that was converted to a green space. Running from April to October, there was so much to see: shade gardens, sun gardens, perennials, grasses, annuals en masse in huge beds, ecological displays, sustainably designed buildings, bee hives, dining halls, music performances, miniature train or cable car rides, hugely popular playgrounds, large lakes and ponds, and recently my favorite, the sustainable crops pavilion and garden where they would show industrial hemp as a valuable resource for fiber, food, oils, and so on. And there was always a special element to each garden. One time it was the largest wooden structure in the world shaped like a giant teepee. Another time it was the refuse of the former Muenchen airport runways shaped into a giant planted pyramid with walkways to the top. Visiting Germany was like visiting Disneyland since we saw castles, strange costumed people, medieval towns, beautifully designed and maintained gardens with thousands of flowers, traveling by magical train or fast driving car to our destinations. We even visited communist controlled East Germany which was scary to enter with the Russian troops at the border, but was like stepping back in time to a bygone era when we visited our relatives and friends. Many modern conveniences, like modern cars with four stroke engines, flushing toilets, and varied produce in the supermarkets besides cabbage and potatoes did not exist. I will never forget the omnipotent sulfur smell of the burning brown coal in the air and the black soot that covered everything, that was used for all heating and even cooking. First and foremost, my dad taught me to love nature and animals. He had a fish pond as a child where he took care of the fish and frogs. He taught me his love for nature by the way he treated all living organisms and natural elements with deep admiration and respect. He would never kill anything, not the spiders that lived in our house, or even the occasional bee or wasp that would fly inside. He taught me how to safely capture the insect with his handkerchief and transport it outside to set it free. I was completely shocked when a girl in a class in high school promptly smashed an innocent spider that was in our classroom. I thought to myself, how could anyone be so heartless? Yes, my dad’s reverence for the natural world was his religion, his god, the center of his spirit. For him nature was the highest truth, and was his place for comfort and rejuvenation. 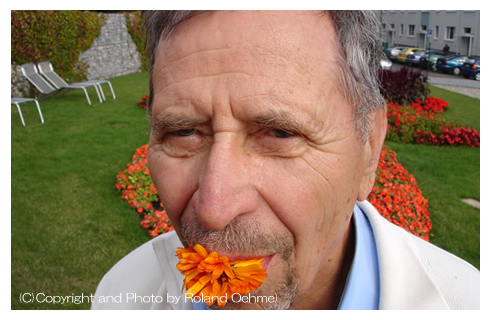 What I felt the most from my dad was his unstoppable passion for creating beautiful gardens for people and nature. I believe my dad’s goal was to reestablish the connection between people and nature. Work and family was his life. He relished each new project and he always advocated taking out all of the lawn if the client agreed, seemingly in order to renaturalize the planet. He abhorred the dead monotony of lawns and he loved nature in all its forms. Seeing a new insect or mammal visit his gardens made him very happy. He put out dog food for the local foxes and to this day the foxes are living in his garden! Nature was his spiritual guide and he would do anything to assist in its rebirth. Through his love for nature, I learned to love nature too. And yet, perhaps it was his daringness to design the most brazeningly unconventional, yet the most beautiful gardens the world has ever seen that attracted many people to him from the beginning of his work in the late 1950’s. He took creativity to the max, designing gardens with huge swaths of bold colors, textures, and large plants that would intimidate any timid garden lovers. It was like he was daring the world to comment and take notice. Well, people everywhere did take notice, and the world has not been the same since. I hope that many people will carry on his concepts and talk about him for many years to come in order to spread his positive message of healing our earth. My dad loved people, and he would famously try to fire up his clients’ enthusiasm for his designs with his infectious passion for his gardens and plants. I sometimes heard people comment that they did not know exactly what he was talking about since they did not understand the botanical names of plants or his German accent, but they eagerly listened to him anyways since he was so interesting to listen to and he was clearly passionate about his subjects. 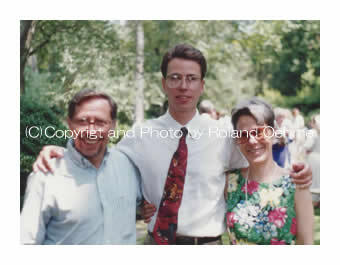 Wolfgang also had many great lifelong friends who were very loyal to him. He also stayed in touch with and we visited his many friends and family in Germany. People loved him since he treated everyone equally and for his infectious passion. He was a great humanitarian. My dad would talk equally to anyone, whether conversing with a client, a contractor, a friend, an architect, a neighbor, a relative, the First Lady of the US, and so on. Thank you dad for being a brilliant, creative, kind, gentle, happy, intelligent, loving, patient, positive, progressive, and warm father. Your spirit lives on in me and our family, and the many people you touched. I will never forget you. I will continue to champion your bold design ideas and your love for nature, doing my part to make the world a better place for all. May your soul have found a happy place that you can beautify with your bold visions. If you want to help the world become a more beautiful place like my father did, then try to create beauty in the world in whatever you do by helping people, helping animals, or helping the environment. Then, send me a message about how you have created beauty in your life. If you are interested in creating a legacy for my father, please contact me at info@greenharmonydesign.com or P 443.470.5729. 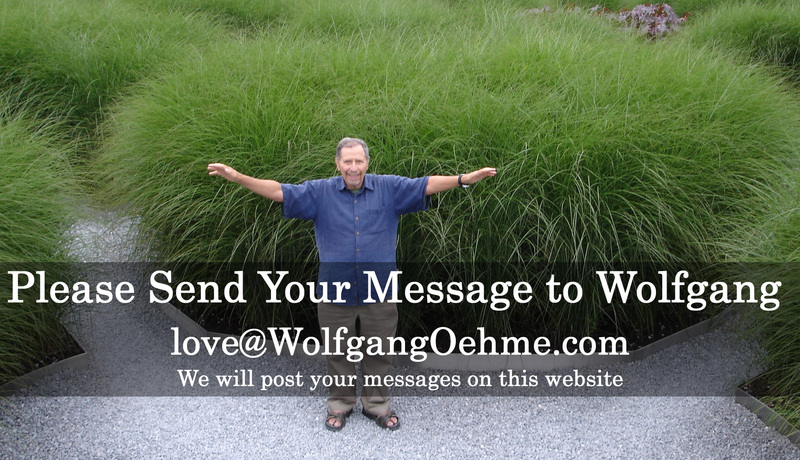 And, if you wish please leave a message to Wolfgang at his website: www.wolfgangoehme.com and his Facebook page called “Wolfgang Oehme”.